This flowchart guides the student through an easy, sequential way of reducing fractions without a big, wordy explanation. Includes answers and explanations to 4 practice problems. 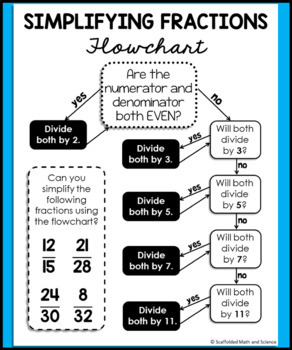 Works best alongside the Divisibility Rules poster where students use "tricks" to check for each divisibility instead of a calculator. This poster also work well to help students break down numbers into their prime factors to find GCF and LCM.